Professor Michael F Dickmann of Cranfield University’s School of Management and RES Forum partner Andrea Piacentini take a look at the third chapter of the RES Forum’s annual report on Business Travellers and the ‘SAFE’ model of GM programme management. The latest RES Forum thought leading Annual Report 2018, Global Mobility of the Future: Smart, Agile, Flawless and Efficient reveals key trends in global mobility with new paradigms in GM programme management, agile working and mobility as a lever for talent management. We take a look at chapter 3 of the report on Business Travellers and the ‘SAFE’ model of GM programme management. The flow of international assignees and the related compliance work are determined by a range of economic, political and legal factors. Host countries use a number of criteria when determining an individual’s right to live and work within their borders.These may include the domestic supply of skilled labour, the assignee’s educational background and skill levels.This article aims to track companies’ programme management and compliance activities, outsourcing approaches and their experiences and fault lines within these activities. It suggests that high quality – error free compliance and programme management is essential for the success of global mobility departments.The article then integrates compliance, outsourcing and general programme management into an overarching global mobility model. In so doing, ten key recommendations to improve flawless programme management are proposed.The last part of the article will draw up conclusions and learning points.The RES Forum, an International HR and Global Mobility networking and information sharing group with over 1600 members in more than 600 companies, based in over 45 countries around the world, surveyed its members on ‘Programme Management and Compliance‘, in November 2017. 54 organizations took part in the survey.They provided insights into the approaches, developments and thinking of large companies. 42 per cent of respondents worked for an Multi National Company (MNC) that had more than 25,000 employees. 83 per cent of respondent companies operated in in excess of 10 countries. 42 per cent had expatriates in more than 25 countries. Three quarters of companies (76 per cent) had highly integrated GM approaches.There was a very broad representation of industries. This research forms the basis of the chapter, “Flawless Programme Management” in The RES Forum Annual Report 2018, Global Mobility of the Future: Smart, Agile, Flawless and Efficient. A summary of the results of research into GM programme management is presented here. We focus on the key issues of outsourcing and compliance, extended business travel and the impact of Brexit before integrating these insights into an overall framework.The RES Forum Annual Reports in recent years have shown that MNCs value quality and risk reduction in compliance, normally prioritizing these above cost savings.These insights can be extended to various areas of compliance (personal and corporate tax, immigration, social security) that often constitute a reason to engage outsourcing providers. Almost three quarters of MNCs conducted their GM work predominantly in-house (72 per cent) while the remainder predominantly outsourced it.It is popular to execute GM work through one global HR service centre (60 per cent) with local (14 per cent) and regional (19 per cent) management being far less common.A fifth of those companies which operate an insourced GM approach are currently reviewing or planning to move to an outsourcing model (20 per cent), a further 15 per cent would consider this for the future with an additional 8 per cent having already started work on this. Thus, the trend to outsourcing seems to continue unabated.Amongst those that already predominantly outsource, multi-vendor models (52 per cent) are common. Companies stated that they chose this approach to support assignees better (52 per cent), to retain in-house control of the overall mobility programme (52 per cent) or to ensure maximal cost savings (45 per cent).Overall, while there is undoubtedly much expertise in-house, essentially all MNCs were prone to outsource some GM elements (see Figure 1). The item outsourced by respondents can be seen in the below figure. Figure 1: If your programme is managed in-house (insourced) which of the following services do you outsource? What drives companies to outsource activities to external providers? The reasons have traditionally been related to costs, quality, flexibility and reliability.Respondents confirmed that the most important reason to use external service providers is compliance (91 per cent), followed by an increase in service reliability (86 per cent), an increase in GM service management quality (81 per cent), cost savings (79 per cent) and GM agility (79 per cent).Thus, there is a strong desire to increase GM programme management quality, expressed through compliance, reliability, quality, agility and costs. These should be the yardsticks of how to assess outsourcing providers and their services. It is one thing to establish a service level agreement for outsourcing, but another to manage the vendor relationship over time.The RES Forum survey also explored how important certain characteristics were during an outsourcing relationship.Respondents confirmed that is was extremely important during an outsourcing relationship that the vendor displayed excellent knowledge and skills (78 per cent) as well as continued to be accountable (78 per cent). Cooperation with internal staff (67 per cent) and flexibility to react to non-standard requirements (61 per cent) were also extremely important.Occasionally, things go wrong in the outsourcing relationship. The RES Forum wanted to understand the size of the impact if things ‘went pear-shaped’. Based on the insights of early annual reports we constructed a list of areas, which can be problematic and asked the survey respondents for their opinions.The key problem areas, each with more than 60 per cent responses, were; poor vendor performance overall, poor vendor resources, lack of time project/service request execution, attrition of key resources (at the vendor site) and poor communication between the organization and the vendor. Where MNCs have a mobility Centre of Excellence, it is highly likely that it works on GM policy writing and management (97 per cent), global vendor management (88 per cent), the management of global tax compliance (76 per cent), assists in assignment documentation (71 per cent) and carries out assignee tracking and management (68 per cent). The latter, however, often still relies on the use of Excel spread sheets (44 per cent), which the RES Forum has lamented in earlier years.Only 17 per cent of companies track assignees in-house using an externally sourced assignee management software tool and 13 per cent have developed their own in-house expatriate software tool.An equal percentage (13 per cent) has outsourced assignee tracking, often using Equus AssignmentPro. Only a minority of tracking software is fully interactive and can share data (12 per cent). Surprisingly, in comparison to our data from 2016, the accuracy of assignee tracking has not improved. 15 per cent of MNCs state that their system does not deliver accurate assignee data, which exposes these firms to compliance risks.One explanation for this apparent step backwards is that the awareness of GM professionals to the tracking risks involved in cross-border commuting, extended business trips and other forms of non-traditional work abroad has probably increased over the last five years.In addition, respondents have been acutely aware of human error and the limits of Excel sheets/manual data collection.Again, we note a lack in the use of intelligent GM systems. Moreover, we believe that there is the possibility to unearth massive efficiency effects within GM information systems in the future. Extended business travel is argued to have substantially increased in recent years. Already in 2006, Welch and Worm argue that business travel has become an essential component of global work.Business travellers may travel to a large number of different countries and have to adjust to various national and local cultures and contexts (Baruch et al., 2013). How do firms track business travellers in order not to fall foul of national legislation?They have a range of internal and external choices stretching from data provided by corporate travel agencies, security teams or internal sources.The data is provided in Figure 2. What is most interesting is that more than a third of companies do not track business travellers, again exposing themselves to potential compliance risks. Flawless programme management is likely to look very different. Figure 2: What Methods do you use to track regular business visitor activity? MNCs appear to find it especially difficult to track extended business travel and they feel vulnerable to compliance problems in relation to this form of global work.In order to strengthen the flawless execution of GM programme management, it is necessary to strengthen the compliance for alternative forms of international work, especially including business travellers. The Economist charted the topics that were most read and reported during the last year (The Economist, 2017). There is little surprise that Britain’s decision to leave the European Union (Brexit) was amongst the most covered topics worldwide in 2017.It devoted substantial space to discussing survey findings about GM professionals’ assessments of the impact of the Brexit decision.At the time of writing this article, the political, social and economic implications are still not clear and immigration rules and regulations have not been formulated for the post-Brexit era. While this is clearly acknowledged by the GM professionals answering our survey, we wanted to understand what they thought was the impact of the Brexit decision on the GM work within their own organizations.The majority of the 39 experts voiced a persuasion that Brexit will increase compliance related needs and complexity which, in turn, would create the need to have a robust approach to how these are managed. Many perceived a degree of insecurity in regard to immigration and social security and a few argued that there would be a reduced number of inbound assignments to the UK.A small number of respondents felt that Brexit “may force us to consider alternate locations to expand our business in the future” and that there may be a “reduced local employee and assignee population in the UK”. One respondent argued that the “greater complexity around immigration will strengthen the case for a competent outsourcing provider” and one saw advantages in a depreciating British currency. One could argue that in a world that is volatile, uncertain, complex and ambiguous (VUCA), the legal and regulatory context is permanently shifting and that hostile environments and market movements require GM departments and their policies and practices to shift, flex and adapt. Hence, complete error-free and optimal GM approaches are not possible. Nevertheless, organizations strive to improve their GM approaches in order to fulfil their SAFE GM objectives. 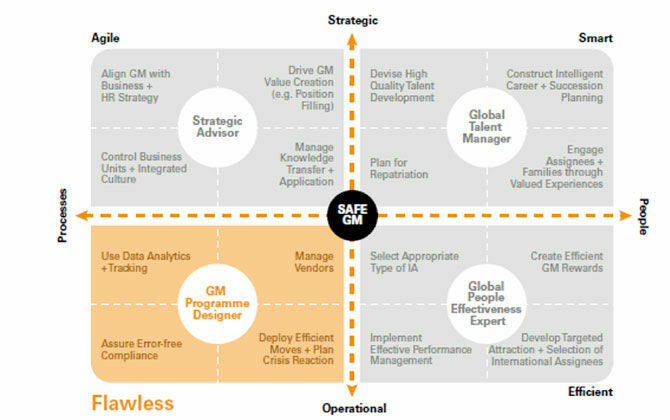 These consist of smart global talent management, agile strategic advice to HR and senior line management, in-depth people effectiveness knowledge that enables efficient GM and flawless compliance.Figure 3 gives an overview of the SAFE Roles of Global Mobility that aim for a shared purpose (between organizations and their assignees), a growth experience for global workers and sustained GM value. The GM programme designer role seeks to make cross-border moves highly effective and compliance error free. For this it may have developed high quality operational approaches. MNCs are most likely to also use outsourcing providers so that tight vendor management is necessary. Sophisticated data analytics that goes beyond mere assignee tracking to also provide relevant data in order to take better informed GM decisions, is likely to improve GM programme management over time. Lastly, in case of humanitarian or natural disasters and crisis situations, it is important to have emergency plans in place. Overall, becoming a high quality programme designer is only one step on the way to leading-edge, effective global mobility management. The challenges identified in this article and the implicit learning points lead us to suggest that, for many companies, certain activities would be useful in optimizing their GM work and to become a true GM programme designer. Strengthen the GM department’s position and influence in order to have suitable and sufficient decision making power in relation to negotiations and contracting with outsourcing providers, assignees and line managers. The RES Forum reports have shown over time – and again in 2018 – that GM experts feel that currently their role is undervalued in their organizations and that they would strive to work more strategically in future. Strengthen in-house service provision where appropriate. This can improve service levels and service speeds, flexibility and can often provide a superior personal touch. In addition, this may support the strategic positioning of the GM department. Strengthen the outsourcing vendor selection process to take account of the organization’s key interests. Overall, these include the need to access up to date local and international knowledge and skills, high levels of vendor accountability, an extensive willingness to cooperate with own staff, a large vendor resource base, rapid implementation capabilities and a high degree of flexibility to react to non-standard requirements. Consider the use of a multi-vendor approach in order to maintain overall control, to seek cost efficiencies and to have the ability to choose best in class. Use selective outsourcing in order to avoid resource bottlenecks and to balance the lack of expert and local knowledge where necessary. Use selective outsourcing to overcome compliance issues with line managers and assignees and to clarify process structures, ownership and decision responsibilities. Use selective outsourcing to gain access to local and international expert and service networks and wider market intelligence which can help to shape strategic and operational GM. Consider using outsourcing providers in the areas of household goods shipment, immigration provision, destination service programmes and tax services provision as MNCs often recommend these because of their high quality of work. Strengthen the management of vendor relationships to encourage better cooperation levels, more extensive data sharing and to implement process improvements (within your own organization as well as within the outsourcing provider). Strengthen assignee tracking approaches, including the tracking of (extended) business travellers and cross-border commuters in order to improve legal, tax and social security compliance. Flawless programme management and compliance is obviously a stretch goal for many MNCs. While this ideal is not readily achievable, any progress must be welcome both for global assignees and their employers. This article is based on Chapter Three of the RES Forum Annual Report, authored by Professor Michael F. Dickmann, professor of International HRM at Cranfield University, School of Management, and produced by The RES Forum, Harmony Relocation Network and Equus Software.To read the full report for free, in-house GM and HR professionals can register to join the RES Forum free of charge. Just click “Join” and enter your details on the website at www.theresforum.com.Relocation Vendors and other interested parties may request a copy of the report by emailing the RES Forum.Relocate’s new Global Mobility Toolkit provides free information, practical advice and support for HR, global mobility managers and global teams operating overseas. Access hundreds of global services and suppliers in our Online Directory ©2018. This article first appeared in the Summer 2018 edition of Relocate magazine, published by Profile Locations, Spray Hill, Hastings Road, Lamberhurst, Kent TN3 8JB. All rights reserved. This publication (or any part thereof) may not be reproduced in any form without the prior written permission of Profile Locations. Profile Locations accepts no liability for the accuracy of the contents or any opinions expressed herein.